A Quick Start Guide to Playing FreeOrion v0.4.4 (update in progress from 0.4.1 version as of Aug 19th 2014). This page is meant to help a new player through their first game and introduce key game concepts, extra information on the full complexity of the game should be on their own pages. See also the "Game Concepts" section in FreeOrion's in-game 'Pedia, especially for the explanation of new features. We're looking for help to port some of the content of the Quick Play Guide to the 'Pedia. See this thread. Start a new Single Player game, taking you to the Galaxy Setup Screen, then into the game itself. Quick Start a new single player game, using the previously used galaxy settings (or default settings if they haven't been changed). Start or load a Multi Player game, taking you to the Server Connection Dialog. After connecting to a server, or hosting a game yourself, you'll be taken to the Multiplayer Setup dialog, where a new multiplayer game may be configured, or a saved multiplayer game loaded. Open the Options window, allowing various game settings to be changed. Some of these options require the game to be restarted to take effect. View the Game Credits, a listing of people who have made significant contributions to creating the game so far. If you are happy with the screen size and location, click on the "Quick Start" button on the main menu to start a game. If you want the window to be a different size or on a different monitor, drag it to where you want it to be and resize it, then exit and reboot, then Quick Start as above. Before you can start playing the server must generate a galaxy, Quick Start will use the default install generation settings, you can change them for future games by selecting Single Player or Multi Player. After the galaxy has been generated, you should see a starmap of all the systems visible to your empire at the center of the screen, with your capital system selected and highlighted. You can drag this starmap around with the mouse and zoom in/out with the scrollwheel. At the top right of the screen, there is a row of buttons: Messages, SitRep, Empires, Objects, Research, Production, Design, Graphs, Pedia, Menu. These buttons are discussed later, but the most important one is "Menu", which brings up the main menu from which you can save or load a game, tweak game options, or resign from the current game to get back to the main title screen that appeared when the game first started. At the top left, there is another button: Turn (and a number). Clicking the turn button ends your turn, causing any orders that have been given to be processed (fleets move, things get researched, etc.). At the bottom left of the screen are the Messages and Empires panels. These can be toggled on and off at the top with the relevent buttons and are blue if visible, grey if not. At some point during the first turn each of the AIs controlling enemy empires will send a brief message stating the name of their empire and that empires level of aggression. This message will be in the colour their units will appear on the map and news about them will be displayed in the Sitrep panel. For now, neither the Messages nor Empires panel is of much use to you, so it's better to toggle them off to display more of the map. There will be one star with a name under it, some half-coloured and half-grey lines sticking out from it, and an icon at the top right. This is your empire's home system. Clicking on the star icon will open the system sidepanel at the right side of the screen, showing the contents of the system. Clicking the star opens the system sidepanel, which displays a star image at the top right with a vertical column of planet images and information below. If there are more planets than can fit on screen, a scrollbar will appear and the panel can be scrolled down using the bar or the mousewheel to see more planets. One of the planets will have a coloured name, which indicates that your empire owns it - other empires' planets will have different coloured names. It may be necessary to scroll down to see the planet your empire controls. If a planet has a population, there will be a series of boxes containing icons below the planet's name, to the right of the image of the planet. The boxes with down arrows at the right side can be expanded by clicking the arrows. Most boxes can be hovered over to see details about what they are or what determines their values. If a planet has no population, it may have a "Colonize" button, that can be used to order a colony ship in the system to colonize the planet. If a planet has a Basic Shipyard built, its name will be underlined here and on the map itself. Similarly if the planet is a species homeworld, it will display in italics. The top box is a droplist which can be used to specify the planet's primary focus. Focus determines what resources a planet's population works to produce. Generally focusing on a resource will produce more of it, but various factors can influence how much of a resource a planet can produce at each focus setting. At the start of the game, your options are Production, Research, Growth and Defence. For now, concentrate on Research is probably best, more information on these options can be found in the game Pedia. The next line shows the population of the planet and the tooltip displays the rate of growth. Next to this is the Happiness of the population (ignore this for now, it does nothing in 0.4.4). Below this is the resources panel, which shows how much of the various resources the planet produces, highest first. Construction is used later in the game to rebuild planetary defences after attack and similar, Research is how fast your empire learns new technologies and Production is used to build new starships, colonies and buildings. Research can be done on the Research screen, accessed by the aptly named button at the top right. Production can be similarly accessed. See below for details on how to use these screens, which are somewhat complicated at first glance. Below the resources panel is the military panel, which shows the planetary shields and defenses of the planet as well as its troop garrison, detection, stealth and supply range. These will improve during the game as you research new technologies. Below the military panel is the buildings panel, which displays icons for all buildings located on a planet. Shown to the top right of your homeworld star icon on the galaxy map is the fleet icon for your starting fleets, selecting these will display the fleet window. If the fleet window is open, right clicking on a star connected by starlanes to the system where the fleet is located gives the fleet a move order. FreeOrion is a turn-based game, so the fleet will only move after you press the turn button. A fleet can be split apart by dragging and dropping its ships to "New Fleet" in the fleets window, in addition right clicking on the fleet will give a series of options, including merging all fleets in the system into one, and splitting the selected fleet up according to ship design. Colony ships can be used to make a new colony: click "Colonize" on the system sidepanel in a system where you have a colony ship and there is a suitable planet—note if the colonise button has a number in red, it's probably not (yet) suitable. Try moving fleets around to explore, making a new colony or clicking on techs in the Research screen to read their descriptions. Read below for a more detailed explanation of how to use the various screen and the various features that have been implemented. You can make more ships join the fleet by dragging the ship itself onto the fleet's name in the fleet window. The little icons below the ship's icon, name and type are in order: damage, structure, shield, fuel, detection, stealth and speed. The latter sections of this guide are a thorough listing of all the features of the game interface, and some other details about how things work. In order to make learning the game a bit easier, this section provides a few step-by-step instructions on how to do common tasks in the UI. These instructions assume knowledge of the terms they use, so if any are unclear, try searching the guide for the terms (using your browser search function) and you should be able to find an explanation. Left click on a fleet icon next to a system. 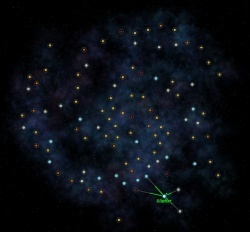 On the galaxy map, right click on a system icon to which you want to order the fleet to move. While a fleet that can be ordered to move is selected, and a system if moused over, a series of moving white dots will show the path the fleet will take if ordered to move to the moused over system. Also indicated will be the points along the path where the fleet will end subsequent turns if ordered to move. These places are indicated with solid white circles with numbers in them that indicate the number of turns it will take to reach the dot's location. A ship will always default to the shortest known path to its destination (even if there are monsters or enemies in the way); if you want to give another path, hold down shift while right clicking to extend the existing route instead of replacing it—this can also be used to tell a ship to go somewhere then double back. 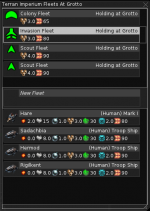 If you've successfully given a move order, the fleet's icon should now be located to the top left of the system icon. There will be a moving series of dots showing the path the fleet will take, much like when ordering the fleet to move. These dots will be coloured the fleet's empire colour, unless the fleet is selected in an open fleet window, in which case the dots will be white. If step 3 does not work, you might have misclicked on empty space, rather than on the system. System icons can be very small at wide zoom levels, and the clickable area near the system scales with the size of the icon as the map is zoomed. Note that you can only order fleets to move to systems to which you know a path along starlanes. A key requirement for acquiring ownership of a planet is that the planet is sufficiently visible to you. If you have ships in the same system but the planet is shown in the MapWindow UI with hashmarks across it, then it is NOT sufficiently visible to you. This can be due to fields interfering with your detection, or some effect upon the planet causing it to have a stealth greater than your Empire's detection strength. Mouse-hovering over the planet in this case will give you a little more specific information, and the Pedia page for your empire will include your detection strength. Unowned planets that are also unpopulated may be claimed by colonization, either as an unpopulated Outpost or as a populated Colony. Planets which are either owned by an enemy empire (whether populated or not) or which are unowned and populated by a native species, are conquered via invasion with troops. Planetary shields will prevent invasion attempts, so if the planet has any shields these must be knocked down to zero by an armed warship before an invasion can be completed. If troopships (any ship bearing troop pads) are present in a system with an invadable planet, then an "Invade" sidepanel button for the planet will be shown, akin to colonization. Invading troops reduce the planetary defense troops on a 1:1 basis. In order to successfully conquer a planet you must invade with more troops than the planet has defending it. If no individual ships are selected, then the UI will attempt to determine an optimal number of ships to use (and may select ships across multiple fleets). To provide a finer degree of control over how many troops are used for an invasion, you may select one or more ships in the Fleet Window; all such ships must be in the same fleet. Open the Research screen by clicking on the Research button at the top right of the screen. (Optional) When the Research screen is first opened, all technology categories are selected and appear on the tech tree. You can select a single category (Learning, Growth, Production, Construction, Economics or Ships) by first clicking "All" to deselect all categories, and then clicking on the category you want. Clicking "All" again will select all categories. Selected category buttons are colored, whereas deselected category buttons are black. (Optional) You can change which types of technologies and technologies of which state are shown to you. Initially you are shown all types and all that you have already completed (Complete) and those immediately following them in the queue (Available). Locked (ie unresearchable) technologies are not initially displayed. It is worth reading through those initially displayed first, then using the toggles (the filter buttons are grey for those showing, black for those hidden) to hide the Complete techs and show instead the Locked techs further away, some of the initial prerequisite techs available might not seem impressive but they open up some very powerful bonuses. Scroll the tree view by left click-and-dragging the view to find the tech you want. Either double click on the tech you want to research or right click and select the 'add to queue' option. If you enqueue a tech which has prerequisites, its prerequisites will be added to the research queue as well. Techs without prerequisites are more lightly coloured than techs with preconditions. By deselecting Unresearchable and Completed techs, you can view only techs without prerequisites. To remove a technology from the research queue, either double click the queue entry or right click and select the remove from queue option in that menu—note you can also use this menu to move the item to the top or the bottom of the queue, this can be very useful at times. You can close the research window at any time by pressing the "Research" button again (top right). Left click on a system you control (system name coloured your empire colour). Left click on the Production button or double click the already selected system. (Optional) Right now, all production categories are selected. You can select a single category (Buildings, Ships) by first pressing "All" to deselect everything, and then click on the category you want. Clicking "All" again will select all categories. Selected categories are gray, deselected ones are black. (Optional) Right now, you are shown only available items (you fulfill the tech prerequisites). You can change this using the "Available" and "Unavailable" filter buttons. Active filters are gray, inactive filters are black. Note that you can only build ships at planets that have a shipyard. You can see the shipyard in the box of building icons below the planet on the sidepanel. Hover your mouse cursor, stationary, over a building icon to get a tooltip that says what type of building it is. To remove an item from the building queue, double click the queue entry or right click the entry and select remove from queue. Note you can also right click and move an item to the top or the bottom of the queue (for example, a newly colonised world might want its shipyard prioritised, etc). You can close the production overlay at any time by pressing the "Production" button again (top right). When the available filter is turned on, the buildable items have black background and the unbuildable ones (when you have the tech but can't build because some other requirement is not met) have dark grey background. To further help you, a tooltip will show the requirements for each building and whether the checks for them were PASSED or FAILED. Ships that move out of the range of their empire's supply lines use fuel to move: one unit of fuel for each starlane jump they make. If a ship runs out of fuel, it can't move. Ships that pass through or spend a turn in a system that has supply lines connected to it are fully refueled instantly, even if they are only partway through a turn's movement. If a ship is stranded far from supply line with no fuel, it regains a little amount of fuel each turn. The only way to refuel it quickly is to extend your empire's supply lines to reach the fleet's system. This can be done by researching various Construction technologies (starting with Orbital Construction), or building a Space Elevator on a nearby planet. These both increase planets' Supply meters, which determine how far supply lines project from the planet. The deep space and black holes COUNT towards this number! Galaxy Shape - The shape the stars are arranged in. Galaxy Age - Older galaxies will tend to have more black holes, red stars and neutron stars, younger galaxies will have more blue stars. Starlane Frequency - The number of starlanes per star. Ships in FreeOrion must travel by starlane. Planet Density - The number of planets per star. Specials Frequency - The frequency with which planets will be generated with specials when the galaxy is created. Some specials will generate monsters, so be careful! Monster Frequency - the frequency with which monsters will be generated. Does not affect monsters generated by specials. Native Frequency - the frequency with which planets with native life will be generated. After setting these options and clicking OK, the game will generate a new galaxy, and after a few moments, bring you into the game itself. FreeOrion can be played with multiple computers and players, see the Multiplayer section for more on this. Clicking with the left mouse button and dragging will move the map around. The scroll wheel zooms the map in and out. Alternatively the plus and minus key on the numeric keypad, or the E and R keys, may be used to zoom the map. There are numerous stars on the map, but at the start of the game only stars visible to your empire are shown. As you move your scouts around more of the map will be displyed, note that each object you control has a detection range circle, this can be improved by researching various Intelligence technologies. 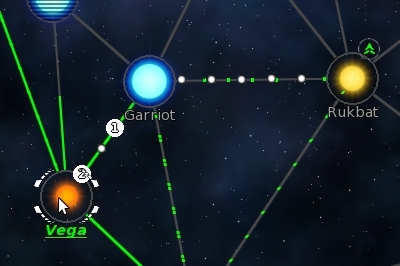 The name of explored systems appear below the star picture on the map. The names of systems in which you control a planet are coloured with your empire colour. Any starlanes connecting systems to their neighbours are shown as white lines, starlanes within supply range of an empire will instead show the colour of that empire. Any fleets you know about in a system are shown by and accessed by clicking on the empire-coloured triangle(s) at the top right corner of the star picture; each empire's fleets get their own fleet icon at each system on the map. When playing multiplayer, press “Enter” to type a chat message to the other players. Press Enter again to send the message. For many of the controls in the Options window, you have to quit and restart the game before they take effect. Enabling and disabling sound and music should happen immediately, however. So does the Autosave setting. At the top left of the screen at almost all times during a game is the Turn Button. FreeOrion is a turn based game. You give orders and view your empire during a turn, then press the turn button to indicate that you are done. After all players have finished their turns and pressed the turn button, the server processes the turn, then sends the results of the next turn back to the players. In a single player game, the server immediately processes a turn after you finish, as the AI players do not take any time to finish their turns. In a multiplayer game, you might have to wait a while while other players finish their turns before you get the results back and continue playing. Be careful: there is no way to undo pressing the turn button, other than reloading a saved game in single player. The turn button is located conveniently far away from anything else on the screen you might be clicking, so it should not be prone to accidental clicking. Pressing the SitRep button in the upper right corner of the screen or pressing F2 will open (or close) the "Situation Report". This is a listing of events that occurred in your empire during the last turn. On the first turn, nothing has happened, so this will be empty. On later turns, if something worth noting happens, the SitRep will automatically pop up when a turn starts. The names of ships that appear in SitRep entries can be clicked to take you to the relevant ship by opening the Fleet Window and selecting the ship. Similarly, names of planets may be clicked to take you to the relevant planet by opening the System Sidepanel to the system containing the planet. When Technologies are researched, you can click their names in the SitRep to open the Research Screen with the new tech selected. If something can be clicked in a SitRep entry, it will underline when the mouse cursor is placed over it. (Note that buildings, which are not yet clickable, will also underline when moused over). Clicking on the home system or any other star with the left mouse button will pull up the System SidePanel (though there may be a short delay while the game first loads planet textures for the first time). The system sidepanel lists information about the contents of a system. At the top of the sidepanel is the system name. Below is a list of all planets in the system, and information about those planets. Once you have two or more systems under your empire’s control, you’ll be able to quickly move to them by clicking the arrows on either side of the system name, or you can click the system name itself to choose a system to jump to from the drop-down list. Alternatively, the X and C keys will walk through each star system with colonies owned by your empire, and the the D key will open the sidepanel to your empire's home-system. Using the keyboard shortcuts in this manner also centres the galaxy map on the system shown. Clicking on empty space on the galaxy map or pressing the S key dismisses the sidepanel. Planets in a system are listed in a column on the sidepanel. Extra planets that don't all fit at once can be seen by moving the scrollbar at the far right of the screen and sidepanel. All planets on the sidepanel have a name, size (eg. medium), and environment (eg. Terran). Populated planets have a population shown by the white icon resembling two people standing next to each other is Population. The number next to it is the current population. Hovering over the icon with the mouse will reveal a popup. The popup displays the current population (Current), what the population will be next turn (Next Turn), the change between this turn and next (Change)(green-growing, red-falling), the maximum population (Max Meter), and how the maximum population was calculated. To change the name of a planet your empire owns, right click it and select "Rename". To colonize an uninhabited planet, you need a colony ship in the same system. In the fleet window, select a colony ship from the bottom half of the list. If you have the proper tech and species button(s) will appear in the system sidebar "Colonize <number/number>" button. The first number is the population of the colony ship, and the second is the maximum population the planet would support. Clicking this button will create a new colony on the next game turn, but will consume the colony ship in the process. After clicking to colonize, if you change your mind, you can click the "Cancel" button to recover the colony ship. The habitability of the planet depends on the species of the colony. 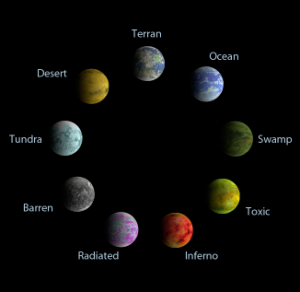 For example, the terran planets are best suited for the Humans, while the barren planets are best suited for the Cray. The image on the left shows the "wheel of habitability". The planet on the top is perfect for the species. The two planets below are good, the two in the middle - adequate, the next pair is poor, and the planets at the bottom are hostile. You can find the habitability for species other than Humans by rotating the wheel accordingly, so that the best-suited planet is on the top. When starting out, many species can only survive on their preferred type of planet. Like many other matters which are difficult in the beginning, this can be amended by researching appropriate technologies, in this case technologies which either allows the species to adapt to the environment or alters the planet environment itself. The planet's type can be changed by Terraforming - it shifts the planet's type to become one step closer to its' preferences. For example, if you terraform a planet that was hostile, it will become one of the poor types. Note that terraforming disappears after you build it, so you can build it multiple times. Also, it is important to note that Terraforming takes effect on the turn AFTER the one it is built in! Gas Giants and Asteroid belts can’t be colonized with regular colony ship. They will not have a Colonize button even if a colony ship is in their system. You will only be able to colonize them with outpost ships. The only difference between a colony and an outpost is the population (outposts have none). You also have two more types of colony ships. They are Colony Base and Outpost Base. They work as the normal ships do, except for the fact that they cannot leave the system they were built in. They are useful for colonizing other planets in the system, though. However, if a new planet is connected to an established planet, such as your empire's homeworld, by resource supply lines, the two can share resources. Resource supply lines are shown by starlanes that are coloured with your empire's colour radiating out from your colonized systems. The distance these supply lines travel is dependent on planets' construction meters, but the lines can also be blocked by enemy ships. If a system is connected to another system with surplus food, or other resources, the surplus will be exported to systems that need extra. If you aren't generating a surplus, you can change the primary focus of planets, including the homeworld, to farming to get more. Keep in mind that the food output will take some time to reach the new maximum value, and that you are handicapping research and production by switching the focus to food. On the system sidepanel, for each planet your empire controls, there will be a box with three pictures, two rows of horizontal bars, and some numbers below. These are the focus selector and meter indicators. 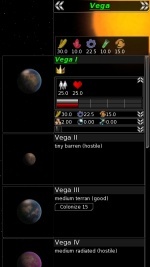 The icons in the boxes represent the three resources in FreeOrion. The bars represent the current maximum values of the meters for the resources on the planet, and the numbers the change in the current meter value in the next turn. The blue icon resembling a test tube is research. Research points are used on the Research Screen, which is accessed by clicking the "Research" button at the top right of the screen. By researching technologies, you can unlock buildings and get various bonuses for your empire. The orange gear represents industry, and is counted in terms of Production Points. Production points are used on the Production screen, which is accessed by clicking the "Production" button at the top right of the screen. By producing ships and buildings, you can explore the galaxy, defend your empire, conquer other empires, and get beneficial effects for your planets. 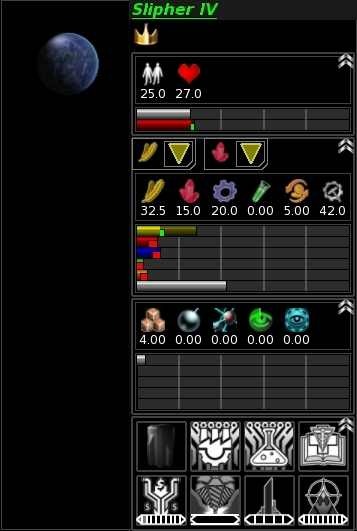 Note that the amount of each resource produced in a system is shown at the top of the system sidepanel, and the total resource production for your empire is shown at the top of the screen, to the left of SitRep and other buttons. The total Production points and Research Points produced by your empire are also shown on the Production and Research screens, respectively. Each planet has a number of "meters" associated with it. Meters are essentially two numbers: a Maximum (max) Value, and a Current Value. The current values of a planet's meters generally have some impact on how the planet functions, while the max values are limits to the current values (the current value of a meter can never be higher than the max value). Meter values are also restricted to the range 0 to 100. There is a meter for each planet for each of the resources in FreeOrion: Industry meter for Industry Points, Research meter for Research Points, and Trade meter for Trade. Resource meters are a measure of how effective a planet is at producing each of these resources; the current value of these resource meters determines the amout of each resource that a planet produces. Various technologies, buildings and specials will improve the total production possible, if a planet is below target it will improve at a rate of one per turn, if above (eg through a focus change) it will decrease by one per turn—but on the turn immediately after a focus change the decrease doubles. Some technologies can affect the rate of meter change. The max and current value of each resource meter for a planet is represented graphically by the horizontal bars below the resource's icon for each planet on the sidepanel: max on top, and current below. Changes in the max meters are shown, with red indicating a decrease and green an increase expected on the next turn. Each planet has a Construction meter on its resource planel. In v0.4, the construction meter affects how fast planetary defences are renewed after a battle or from colonisation, other uses for this meter are planned. You cannot directly control the values of meters on your planets. However, you can affect planet resource production by “Setting Focus”. 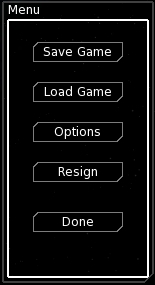 On the system sidepanel, on the box for each planet you control, the rolldown menu shows all the possible settings. You choose the focus of the planet by clicking one of them. You will see the expected size of the resource meter outlined below immediately. Note that not all planet types have all settings available. Focus settings affect resource production by applying bonuses to the planet's max resource meters. At the start of the game, planets produce nothing of any non-focused resource, and 0.2 per population for the focused resource. The Cultural Archives building found on your homeworld provides a flat +7 bonus to research and an additional 0.2 per population bonus to production for your homeworld (and later any captured AI homeworlds) only. Later in the game, researching technologies or producing buildings can apply additional bonuses to resource meters on planets with certain focuses, depending on other conditions, or to all planets. Planetary specials may also give bonuses to resource meters on planets. It's important to realize that changing a planet's focus doesn't immediately set the resources it is producing to correspond to the new focus. Resource production is determined by a planet's current meter values, while changing focus affects the planet's max meter values. It takes time for a planet to reconfigure its infrastructure to produce new resources whenever a focus change is made, which is represented by the growth of the current meter values over time. Changing focus might cause an immediate drop in a planet's resource production, however (after ending the turn), because current meters are capped by their corresponding max meter values. There will be a tiny triangle hovering near your home-system. This is a "fleet icon" or "fleet button". Every system has a fleet icon for the fleets of each empire you know has a fleet in the system. Additional fleets owned by the same empire are shown by a single fleet icon. You begin the game with two scout ships and a colony ship in a fleet called "Home Fleet". Since no other empires have any fleets in your home system at the start of the game, your empire's is the only fleet icon that appears next to the system. Clicking on the fleet icon will open up the Fleet Window. While the fleet window is open, right clicking on empty space will dismiss the Fleet Window, as will left clicking the tiny X in the upper right corner. The V and B keys will walk through each fleet owned by your empire. The F and G keys can be used to walk through each fleet owned by your empire that is idle (as in, not moving). The top half of the fleet window is a listing of fleets at the current system. Every ship is in a fleet. Clicking on a fleet will display the ships contained by that fleet in the bottom half of the fleet window. Clicking and dragging a ship from the bottom of the fleet window to the top, and dropping it onto a different fleet will transfer the ship between the fleets. The fleet labelled "New Fleet" is a special fleet; if you drag a ship onto this fleet, a new fleet is created for that ship (you don't actually have a fleet called "New Fleet"). You can also select multiple ships to drag by clicking on each ship: clicking once selects the ship, clicking again deselects the ship. When you drag a ship, if multiple ships are selected, all the selected ships will be dragged together. You can also drag-drop entire fleets; dropping a fleet into or onto another fleet will merge the dropped fleet's ships into the new fleet, deleting the dropped fleet. Just like planets, you can rename fleets and ships by right clicking on them and selecting “Rename”. You can also scrap (destroy) ships by right clicking and selecting "Scrap Ship". You can move fleets to new systems by selecting the fleet in the fleets window, then right clicking on the star you wish the fleet to move to. When you do this, the fleet icon will move to the bottom left corner of the star picture, and you’ll see an animated dashed line marking the path the fleet will take. There must be a known starlane leading to a star system in order to move ships to it. Fleets can be ordered to move to star systems many starlane hops away from their present location. The fleet will automatically follow the shortest path from where it is to where you tell it to go. If you uncover new starlanes that make a new path shorter while the fleet is en route, the fleet's path will update accordingly. Each turn, you’ll see the fleet triangle move along the starlanes to its destination. When a fleet enters (or passes through) an unexplored system, your galaxy map will update with newly discovered starlanes and system name. If a military ship enters a star system containing ships or planets belonging to another empire, combat occurs. In v0.3, there is no tactical combat. For now, you’ll just receive a brief overview of the combat results. If an enemy ship is present at your planet, it blockades it. It blocks all production on this planet and might affect supply lines of other planets. Note that the blockade does not affect research. New ships may be built on the Production Screen. Clicking the Research button at the top right of the screen opens the research screen. Clicking the button again closes the research screen. Pressing F3 similarly opens or closes the research screen. You can also open the research screen by clicking on a link from a SitRep entry. Technology research in FreeOrion works according to the model that each tech has a certain Research Point (RP) limit per turn, and takes minimum number of turns to research. Each tech can have at most it's RP limit applied towards it each turn. You can spend less than the limit, which often happens to the last funded tech in the queue. If underfunded, a tech will merely take longer than it's minimum research time. The top left research summary panel shows how many Research Points your empire is producing, how many of these points are being wasted by not being spent to research a tech, how many techs you are currently actively researching (how many are receiving RPs this turn), the number of RPs going to the underfunded project (often the last funded project on the queue does not receive its RP limit each turn) and how many research projects you have enqueued total. Below the summary panel is the research queue itself. Techs that have been enqueued are shown by boxes on the queue. Multiple techs may be enqueued simultaneously, and if too many techs have been enqueued to fit onto the queue at once, a scrollbar will appear at the right of the queue. Techs may be reordered on the queue by dragging and dropping. Reordering techs in this manner changes their priority, which is important because available RPs are applied to techs in priority sequence from top to bottom on the queue, up to each tech's per turn RP limit. Techs may be removed from the queue by double clicking on their box on the queue. Any progress on partially completed techs is retained, even if they are removed from the queue. If re-enqueued later, research will resume where it left off. The name of a tech appears at the top of its box on the queue. Below, a progress bar fills up to indicate visually the progress being made in researching the tech. At the bottom left of the tech box is the RP limit per turn and minimum number of turns required to research the tech. At the bottom right, the estimated number of turns to finish the tech is shown (at current RP production levels). This estimate takes into account the time required to finish techs higher in the queue before the tech in question receives partial or full funding. The largest section of the Research Screen is the tech tree view to the right of the queue. This view shows the technologies in the game, connected by arrows to show their prerequisite relationships; most techs require one or more other techs to be researched before they can be enqueued. Each tech box on the tree view also shows the name of the tech, an icon at the top left to indicate the tech's category, as well as the RP per turn limit and minimum research time for the tech. If a tech has been enqueued, is being researched, or has been completed, this is indicated in a sub-box at the bottom right of the tech box on the tree. To enqueue a tech, you can double click on it in the tree view, or you can single click on it, and then click "Add to Queue" at the top of the Research Screen. The tree view may be scrolled similarly to the galaxy map, by clicking (not on a tech) and dragging with the mouse, or by using the scrollbars at the bottom and right sides. There are several view options for the tech tree. Directly above the tree, there are tech category buttons. Clicking these will limit the techs shown on the tree to techs in the appropriate category (or show all categories simultaneously, for "All"). Below the tree view, options are available to show only researchable, researchable and complete, or all techs, and only theory techs, applications and theories only, or all techs. Techs on the tree view are shaded differently to indicate their status. From light to dark are techs that have been enqueued or researched, techs that may be enqueued, and finally techs that are not yet available to be researched. Construction - techs that increase Construction meters, which determines how fast current resource meters grow upwards to their corresponding max meter values. Later this category will also include techs that are prerequisites for many buildings. Defense - techs that unlocks planetary defense of various types. Future versions of FreeOrion will likely add additional tech categories. If a tech is clicked on the tree view or the queue, or if a SitRep link is clicked to open the research screen with a tech selected, the tech appears at the top centre of the research screen. The name of the tech, its category, and its RP limit and minimum research time are shown. Below the name, some descriptive text about the tech appears, superimposed over the category icon of the tech. If a tech is a theory, this descriptive text will be just for entertainment purposes. Application techs, however, may either unlock a building, which will be indicated in the descriptive text, or may have some effects. In v0.3, effects of techs (and buildings) generally give bonuses to planet meters, usually subject to some condition such as the focus setting of the planet. To the right, a technology icon may appear, if one has been created for the tech. To the right, above the tech icon, there are buttons that may be clicked to add the tech to the queue, or to centre the tree view on the tech. Centring the view will only work if the tree view is set to show the tech. That is, the research status and tech type options (below the tree view) must include the type of the tech to be centred. Also, if the current category setting (above the tree view) does not show the tech, this will be changed to the tech's category automatically. To the right of the tech detail view, there is a box that shows the prerequisites of the selected tech, as well as the techs for which the selected tech is a prerequisite (or what it "unlocks"). These are coloured similarly to the tech boxes on the tree view to indicate whether the techs have been researched or enqueued, are available to be research, or are not yet available due to having unresearched prerequisites. The techs listed in the relations box may be clicked to select them in the detail view, and to centre the tree view on them. Clicking the Production button at the top right of the screen opens the production screen. Clicking the button again closes the production screen. Pressing F4 similarly opens or closes the production screen. Double clicking on a system on the galaxy map also opens the production screen, with the double-clicked system selected. When first opened after starting or loading a game, the production screen may be mostly blank. This may be remedied by clicking on a project in the buildable items list, or by clicking a system on the central galaxy map portion of the production screen. The production screen is somewhat like a combination of the research screen and the galaxy map with the sidepanel open. The sidepanel appears and works mostly the same as it does on the galaxy map. The centre of the production screen is the galaxy map itself. The top and left sides of the production screen are the project information box, summary panel and queue, similar to the research screen. Production in FreeOrion works similarly to research. Each production project has a certain Production Point (PP) limit per turn, and takes minimum number of turns to build. Each project can have at most it's PP limit applied towards it each turn. You can spend less than the limit, which often happens to the last funded project in the production queue. If underfunded, a project will merely take longer than it's minimum build time. The top left production summary panel shows how many Production Points your empire is producing, how many of these points are being wasted by not being spent to produce anything, how many projects you are currently actively producing (how many are reciving PPs this turn), the number of PPs going to the underfunded project (often the last funded project on the queue does not receive its PP limit each turn) and how many production projects you have enqueued total. The production queue works largely the same as the research queue. Just like the queue on the research screen, the queue is located below the summary panel. Projects that have been enqueued are shown by boxes on the queue. Multiple projects may be enqueued simultaneously, and if too many projects have been enqueued to fit onto the queue at once, a scrollbar will appear at the right of the queue. Projects may be reordered on the queue by dragging and dropping. Reordering projects in this manner changes their priority, which is important because available PPs are applied to projects in priority sequence from top to bottom on the queue, up to each project's per turn PP limit. Right-clicking on a project's box/panel on the queue brings up a menu that allows the item to be moved to the top or bottom of the queue, to be paused or resumed, or to be removed/deleted (be careful with that last one, there is no undo for it!). Unlike the research queue, any progress on partially completed projects is lost if they are removed from the queue. If re-enqueued after being removed, a project will restart from the beginning of production. Just like the techs on the research queue, the name of a project on the production queue appears at the top of its box on the queue. Below, a progress bar fills up to indicate visually the progress being made in producing the project. At the bottom left of the tech box is the PP limit per turn and minimum number of turns required to produce the project. At the bottom right, the estimated number of turns to finish the project is shown (at current PP production levels). This estimate takes into account the time required to finish projects higher in the queue before the project in question receives partial or full funding. Clicking a project on the production queue selects it, and shows details about the project in the production detail view at the top of the production screen, and also centers the map on the system where the project it being built. Double-clicking on a project likewise selects the project and centers the map, and furthermore selects the planet at which the project is being built on the production sidepanel at the right side of the production screen. When a planet is selected, all projects being built within that same system will have their location name on their project boxes be bolded and written in the player's empire color, to facilitate review of all projects being built at that system. Ship construction projects can be for a block of units in parallel, and can also be set to repeat multiple times sequentially; these are controlled by small numeric dropdowns in the upper center-left portion of the project box (in between the project icon and the project name). The dropdown with a circle-arrow is the repeats dropdown, and the one with an 'x' is the blocksize dropdown. At the bottom of the production screen, to the right of the production queue, below the central galaxy map and to the left of the production sidepanel, is the buildable items list. This list contains all the items that you can build. Directly above the list, there are category buttons. Clicking these will limit the buildable items shown in the list to items in the appropriate category (or show all categories simultaneously, for "All"). By clicking on a buildable item in the list, an item may be selected. When selected, details about the item are shown at the top of the screen in the buildable items detail box. If a planet is selected on the production sidepanel, a buildable item may be enqueued, to be built at the selected planet, by double clicking the item in the buildable items list. Scout - A fast civilian ship, cheap to build. They are good for exploration, but can’t fight. Colony Ship - You’ll need colony ships to colonize planets. Colony Base - A colony ship that cannot move out of the system it was built in. Useful for colonizing other planets in the system. Frigates, Cruisers and Corvettes - Attack ships. You can use these to fight enemy attack ships, or destroy (or force to retreat) enemy Scouts and Colony Ships. Plus they can be used to knock out the defences of enemy planets prior to invasion. Troop Ship and Small Troop Ship - Invasion ships, used to deploy ground troops to take control of enemy planets. At the start of the game, no buildings are available to be produced apart from the Basic Shipyard and the Imperial Palace. You must first unlock buildings by conducting research on the research screen. Once unlocked, various buildings become available. Details about the buildings may be read by selecting them on the Available list on the production screen, and reading their descriptions, particularly the effects descriptions, in the project information box at the top of the production screen. Many buildings in v0.4.4 give bonuses to planet meters. Many only give a bonus to a meter if a planet's primary focus is that resource, though some affect all planets in your empire. Note that currently the Available setting lists also the buildings already built on the given planet and the buildings you cannot build on a given planet (for example, it will list all the shipyard extensions even if you do not have the Basic Shipyard built). In the middle of the production screen, above the buildable items list, to the right of the production queue, below the production detail box and to the left of the production sidepanel is a view of the galaxy map. This view works nearly the same as the standard galaxy map (when the production screen is closed), except that fleet buttons cannot be clicked, and clicking on a system once opens it in the production view (as opposed to requiring a double-click on the standard galaxy map). The map may be zoomed and drag-scrolled as normal. At the right side of the production screen is the production sidepanel. This works almost exactly the same as the regular sidepanel, seen on the galaxy map when a system is selected. 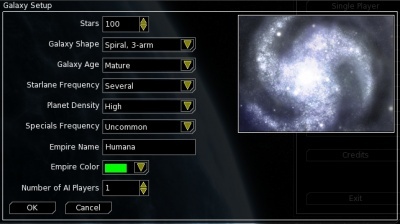 The one difference between the galaxy-map system sidepanel and the production screen sidepanel is that on the production screen, clicking the image of a planet selects that planet. When selected, planets are the location at which enqueue buildable items are placed. Note that the system selected in the galaxy map sidepanel and the system selected in the production sidepanel are tracked separately. This allows you to open the production screen to the previous system that it was open to after changing the system shown on the galaxy map sidepanel, which may be convenient. This may also be unintuitive, so may be changed in later versions. If a production project is selected on the queue, or a buildable item is selected on the buildable items list, details about the project or item are shown in the production details box at the top-middle of the production screen. Similar to the technology details box on the research screen, effects of a building are listed, along with an image (if available) and some descriptive text. Ships have an image shown, as well as information about their attack and defense strength and descriptive text. If the buildable item is selected on the buildable items list, and a planet is selected on the production sidepanel, then an "Add to Queue" button may be clicked above the image for the item. by eliminating all ships and planets belonging to other empires. Note that there is not yet a SitRep message for this victory type. be capturing the Experimentor Outpost that may be hidden somewhere in the galaxy - note that Experimentors are not guaranteed (yet) in every galaxy, when they launch monsters a sitrep will warn you but they are meant to be an end game challenge. Setting Monsters to "none" will ensure they're not in your game. AI empires will be more aggressive depending on their max aggression settings, both Maniacal and Aggressive AIs are actually capable of defeating other AIs and winning the game themselves, the Beginner level AI will normally leave other empires alone and merely try to defend itself. Most AIs will be at the max aggression selected (the default is "typical"), a small proportion will be at one step below that level (if there is one). A very nominal diplomacy feature has been enabled, you can make peace offers to AIs. Maniacal AIs will always decline the offer, others will have a chance of agreeing to peace and free movement of ships within territory. This feature is planned for substantial improvement. Research the technologies that increase the maximum population supported by your planets. Subterranean Habitation is one of them. Research Orbital Construction - it increases the supply range of the colonies. Remember the part about supply lines? Research the technologies increasing a meter for all planets. For example, Adaptive Automation increases the industry meter on all planets by 5. So does Nascent Artificial Intelligence, except it affects research output. Remember to scout and colonize more planets. You won't go far with a single planet. Terraforming is vital if you want to use Gaia Transformation, as the latter can be built only on planets perfect for your species. Information is power, the Intelligence detection techs are vital to improve your information gathering. Peace with an opponent can mean there is one less front to handle. Though a peace offer are not always accepted, and Maniacal AIs will never make peace, so don't count on it until you have agreement. Have fun experimenting with this early demo of FreeOrion, and thanks for helping test it. Feel free to drop by the FreeOrion forums if you have questions, want to share you experiences playing the game, or want to pitch in and help build the next version of the game. If you discover bugs in the game, please use the bug tracker to report them. If you have time, please check the resolved bugs, to see if the bug you're reporting has already been found and resolved in the latest version of the code. If you'd like to bugtest more seriously, you are encouraged to download and compile the latest version from Subversion (SVN), if you are able to do so. This page was last modified on 2 May 2017, at 08:14. This page has been accessed 319,319 times.